The NASDAQ-100 is an index which includes 100 of the world’s largest non-financial companies listed on the wider NASDAQ Stock market, based on their market capitalisation. The NASDAQ-100 Index represents all sorts of companies across major industry groups, from computer software to retail or biotechnology. However, the NASDAQ-100 companies do not include financial trading or investment firms. 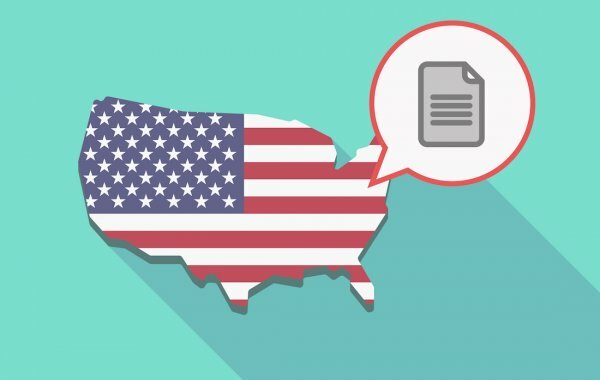 Where have you heard about the NASDAQ-100 Index? You’ve probably already heard of the NASDAQ. The NASDAQ-100 Index, however, isn’t its main index – that’s the NASDAQ Composite, one of the world’s major stock indices. You will find many well-known brands listed on the NASDAQ-100 Index including Google, Starbucks, Microsoft and Tesla. Graph depicting the NASDAQ-100 Index between 1985 and 2017. The graph represents the climb in the Total Return year on year, between January 1985 and January 2017. Cumulatively, the NASDAQ-100 Index has gained by 5211%, which can be broken down to an annualized return of 25% and annualised volatility of 26%. The Nasdaq-100 Index (or NDX) was launched in January 1985. The NASDAQ Stock Market itself was founded in 1971 and was the first stock market in the United States to bring trading online, focusing mainly on technology-based companies including Google and Oracle. At first it did not provide access to actual trading and acted solely as a quotation platform. It helped lower the spread (the difference between stock asking prices and bidding prices), which was unpopular among brokers as this was where most of their commission came from. Over the years, NASDAQ has become more of an online trading platform. There is no physical trading floor, as all trading is done through telecommunicating and online. It’s main index, the Composite Index, has been published since the company’s inception, while the NASDAQ-100 Index and the NASDAQ-100 Financial Index were founded in 1985 to track the largest 100 companies in terms of stock value. Why did they create the NASDAQ-100 Index? The Nasdaq-100 and the Nasdaq Composite indices were comprised by the NASDAQ in an effort to promote themselves in the shadow of the NYSE. The NASDAQ-100 Index companies are strictly non-financial, and include pharmaceutical, retail and technology corporations, whereas the NASDAQ 100 Financial index deals with banking, insurance and brokerage companies. When it first started, the base price of the NASDAQ-100 Index was set at 250 points, but it closed at almost 800 at the end of 1993. The following year they reset their base price at 125, so that it was now below that of the NASDAQ Composite. NASDAQ-100 Index closing price between 1985 and 2015. The closing price peaked in 2000 at the height of the Dot Com Bubble, then falls to it's lowest during the financial crashes of 2002 and 2008. Since 2008 the market has recovered and has grown steadily until 2015. 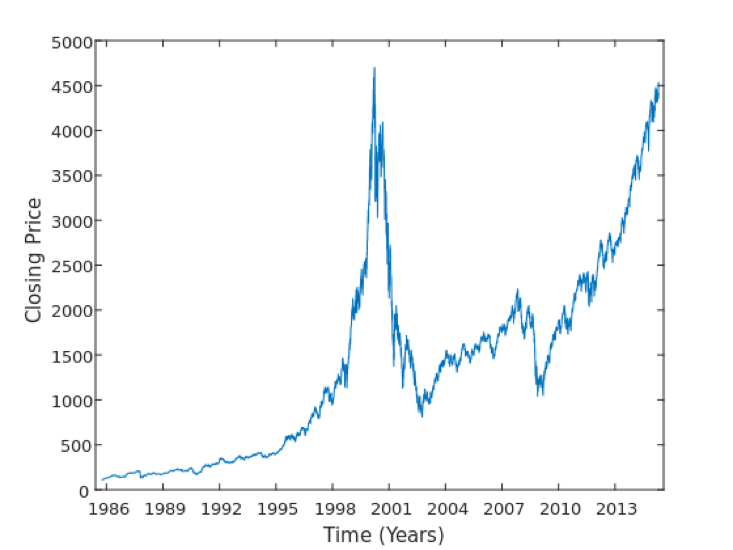 The Nasdaq Composite Index from 1985 to 2013. Similarly, to the Nasdaq-100 Index, the Nasdaq Composite Index peaks at 2000, then declines rapidly by 2003. A gradual climb thereafter is knocked in 2009. Unlike the Nasdaq-100 Index, the Nasdaq Composite begins to fall again after 2013.
International companies were first allowed to join as NASDAQ-100 Index companies in 1998, but the standards set for them were higher than domestic companies. This was resolved in 2002, when the market reached its all-time low. What is the NASDAQ-100 all-time peak? 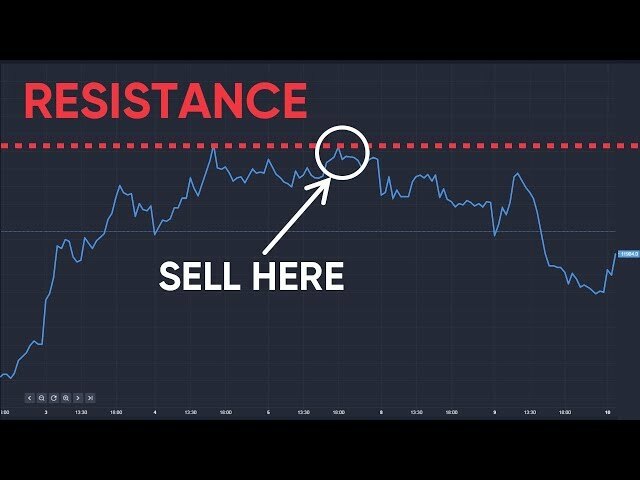 What is the NASDAQ-100 all-time low? 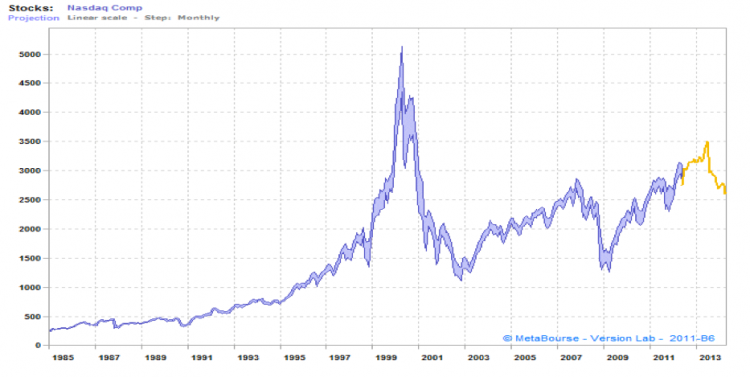 The all-time high of the index was set at the height of the so-called ‘dot-com bubble’ in 2000 and was standing above 4,700, though just two years later in 2002, various factors put an end to this boom. The recession was beginning to hit, the 11 September 2001 attacks had a hugely negative effect on all stock markets and the subsequent Afghan war all contributed to the fall of the NASDAQ-100 index to around the 900-point mark. It took approximately five years to gradually recover, and then the intraday high of 2,239.51 on 31 October 2007, was reached. This was the highest it had soared since February six years prior, but soon afterwards the fate of investment banking caused panic as the late-2000’s Global Financial Crisis of 2008 began. According to the investment management firm, the Vanguard Group, the generally accepted measure of a bear market is a “price decline of 20% or more over at least a two-month period”. During this time, the NASDAQ-100 companies along with many others experienced a Limit Down in October and reached their lowest point in over six years – and intraday low of 1,108 in November 2008. 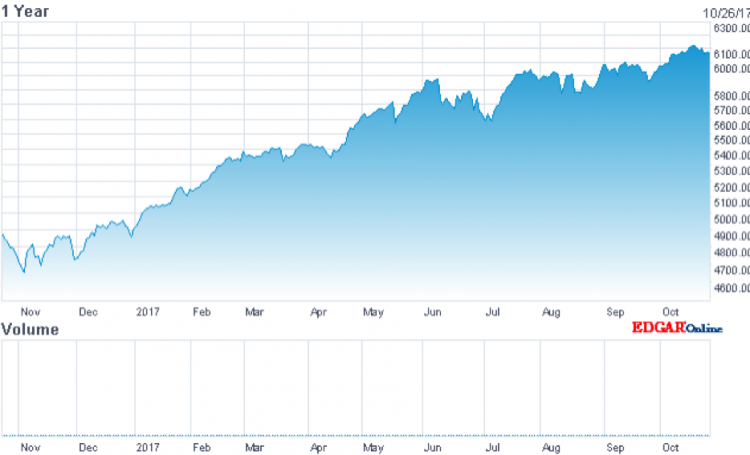 Despite plunging into bear market territory during the global financial crisis of 2008, NASDAQ-100 has since rallied and reached highs in the months following the election of US President Donald Trump. October 2017 showed a record high for the NASDAQ-100 Index. What is the NDX? The NDX is the abbreviation of the NASDAQ-100 Index in the derivatives market. The PowerShares QQQ exchange traded fund (or ETF), sponsored and overseen since 21 March 2007 by Invesco through PowerShares, trades under the ticker NASDAQ: QQQ. It was formerly called NASDAQ-1000 Trust Series 1, but in 2004 it was given the nickname QQQQ or the ‘quad Q’ by traders. In March 2011, NASDAQ changed its symbol to QQQ. In 2000, it was the most actively traded security in the United States, but has since dropped to being within the top five after other stocks. Since August 2012, the fund is the third most actively traded exchange-traded product in the world. What is the NASDAQ-100 criteria for companies? The NASDAQ has strict standards that companies must reach in order to be featured on their market. These include being exclusive to NASDAQ in either the Global Select or Global Market tiers, having average daily volume of 200,000 shares, and not being involved in bankruptcy proceedings. Before 2014, companies could only have one class of stock in the NASDAQ, but since then the regulations have changed and companies may include multiple classes included, provided they meet the NASDAQ criteria. The NASDAQ-100 Index is composed of the 100 largest stocks (based on market capitalisation) traded on the NASDAQ. This index is computed using a modified market weighting. Although firms with the largest market caps tend to have the largest influence on the index, its value is modified to keep any issues from having an "overwhelming" effect on the index results. The largest firms have the biggest impact on its value. However, there are limitations on the weights, so no company can have too much influence on price. The maximum allowed is 24% of the weight of the index. What is the NASDAQ-100 Index used for? The NASDAQ-100 Index is a way for traders and brokers to get a snapshot of how the firms included in the index are faring. It includes many of the USA’s top technology stocks, so it’s easy to see and compare their values by looking at the index. The only problem is that, due to the heavy weighting of the NASDAQ-100 towards technology stocks, this makes it harder to gauge the overall market. The NASDAQ 100 trades in various forms. Hedge funds and personal investors often use the index to hedge their portfolios. Because of its wide usage, the NASDAQ-100 is one of the most heavily traded indexes in the world. Keep up to date with real-time NASDAQ-100 Component values at CNBC. Read more about NASDAQ, NASDAQ Composite and the NASDAQ-100, and keep up with real-time market activity on the official NASDAQ website.